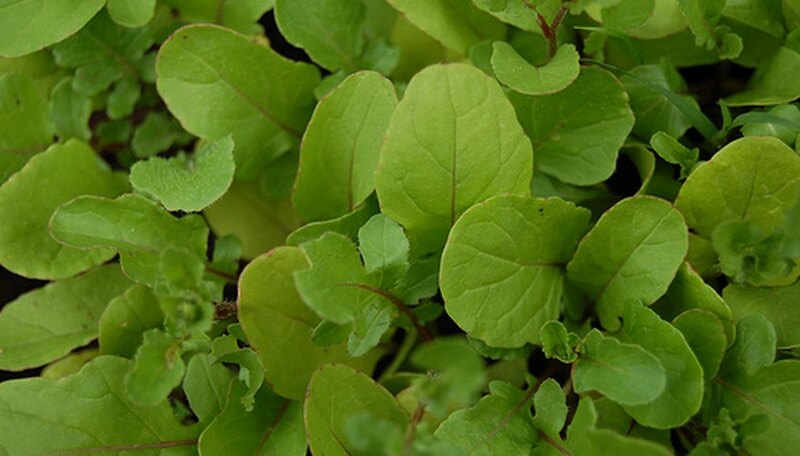 Arugula delivers a spicy taste that can add extra flavor to salads and sandwiches. Arugula dark leaves are high in vitamin A, C, K and calcium. Arugula also contains antioxidants that are useful in preventing cancer, and high amounts of chlorophyll that help to circulate oxygen through the body and cleanse the blood. Grow arugula indoors to better incorporate the fresh and healthy greens into your diet. Fill a 4- to 6-inch clay pot with loose potting soil. Add 1/2 cup of composted soil from your home compost system for fertilizer. Plant four seeds in the pot so that they are 2 inches apart. Cover the seeds with 1/8 inch of soil. Add just enough water to moisten the soil. Check your arugula pot daily to make sure the soil has not dried out. The soil should be moist each day, but not soggy. Place the arugula in a somewhat shady area of your house so that the pot gets about 4 hours of sunlight a day. Arugula prospers best under indirect rather than direct sunlight. Remove any dead or yellowed leaves from your arugula once a week to maintain the plants health. The plant is ready to harvest after 40 days from planting date. The entire plant can be harvested, or you can harvest a few leaves at a time. Harvest the leaves when they are about 2 inches long and young. Older leaves tend to taste bitter, especially, when the plant begins to flower.